Plant Notes: It would seem that Tabebuia pentaphylla (L.)Hemsl. and its basionym are both legitimate, according to Art. 52.2. This name would then have precedence for the wide species concept of T. heterophylla. See Gentry (1992:193-198) for a discussion. The usage of Bignonia leucoxylon L. in Tabebuia is probably blocked by Tabebuia leucoxylla (Vell.)DC. 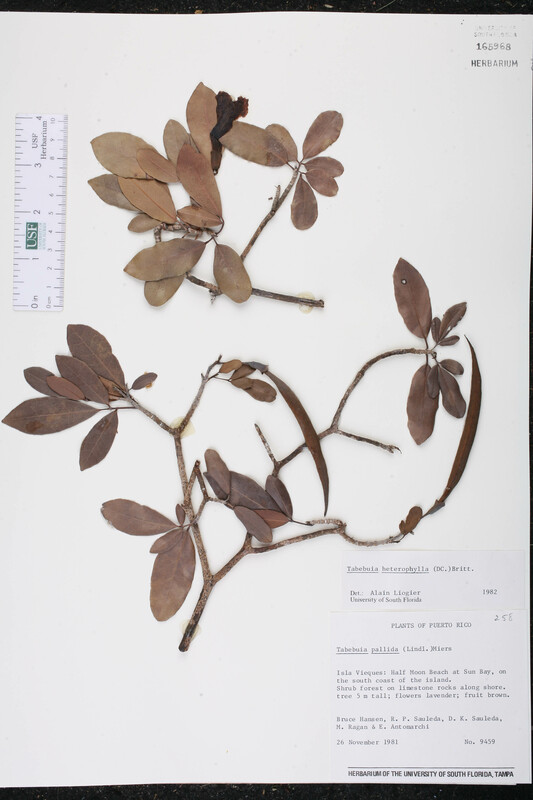 Citation TABEBUIA HETEROPHYLLA (de Candolle) Britton, Ann. Missouri Bot. Gard. 2: 48. 1915. Basionym: Raputia heterophylla de Candolle 1824. Type: PUERTO RICO: Without data, Bertero s.n. (holotype: G-DC). Bignonia leocoxylon Bignonia leocoxylon Linnaeus, Sp. Pl. 624. 1753. TYPE: JAMAICA: Without data, Hort. Clifford s.n. 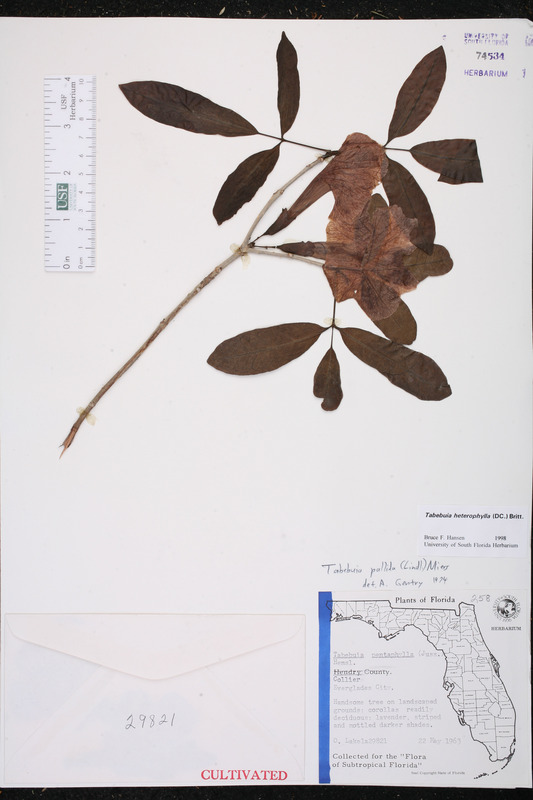 (lectotype: LINN 776.4) Lectotypified by A. H. Gentry, Fl. Neotrop. 25(2): 193. 1992. Bignonia pentaphylla Bignonia pentaphylla Linnaeus, Sp. Pl., ed. 2. 870. 1763, nom. illegit. BASIONYM: Bignonia leucoxylon Linnaeus 1753. Raputia heterophylla Raputia heterophylla de Candolle, Prodr. 1: 734. 1824. TYPE: PUERTO RICO: Without data, Bertero s.n. (holotype: G-DC). Tabebuia heterophylla subsp. 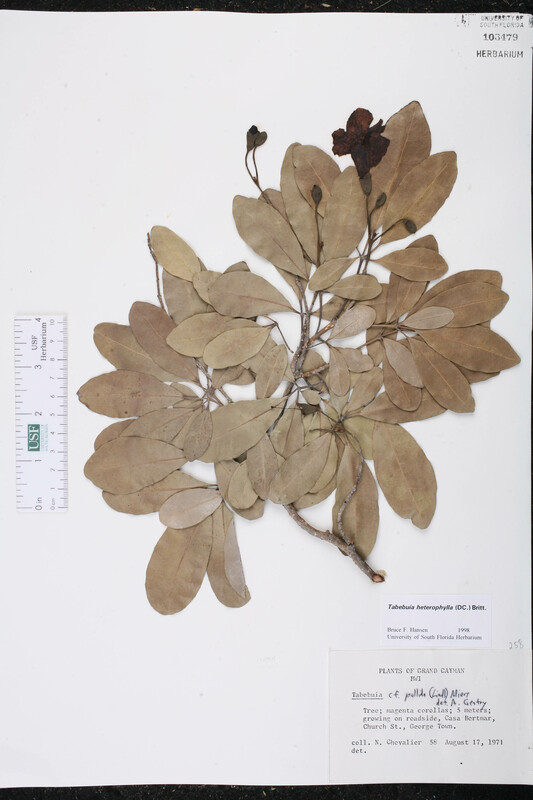 genuina Tabebuia heterophylla (de Candolle) Britton, subsp. genuina Stehle, Bull. Soc. Bot. France 93: 30. 1946, nom. inadmiss. 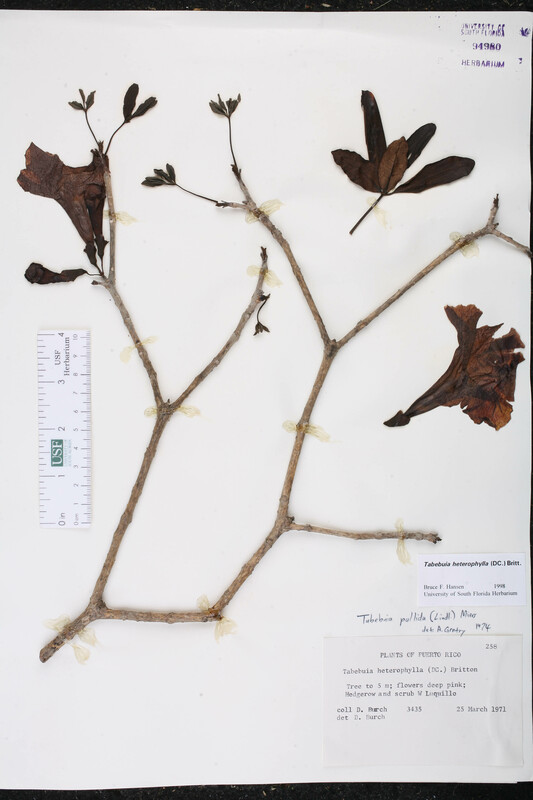 BASIONYM: Tabebuia heterophylla (de Candolle) Britton 1915; Raputia heterophylla de Candolle 1824. Tabebuia pallida subsp. heterophylla Tabebuia pallida (Lindley) Miers, subsp. heterophylla (de Candolle) Stehle, Caribbean Forest. 6(Suppl. ): 338. 1945. BASIONYM: Raputia heterophylla de Candolle 1824. Tabebuia pallida subsp. pentaphylla Tabebuia pallida (Lindley) Miers, subsp. 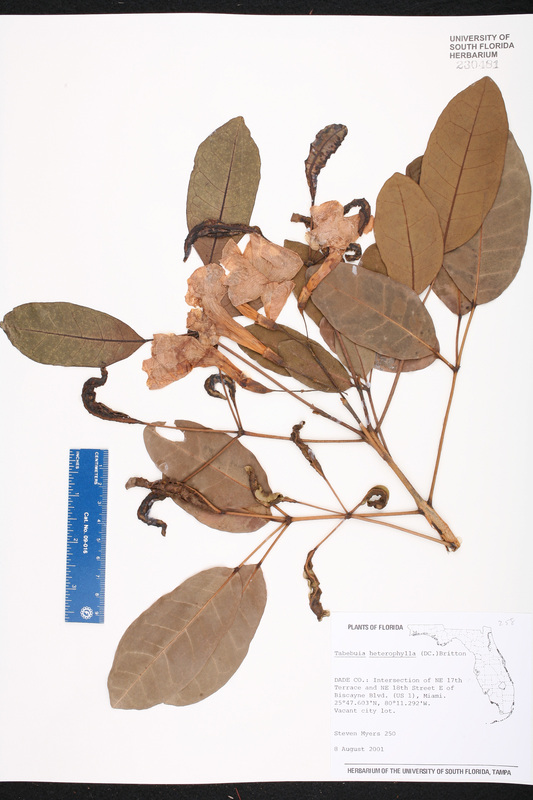 pentaphylla (Hemsley) Stehle, Caribbean Forest. 6(Suppl. ): 338. 1945. 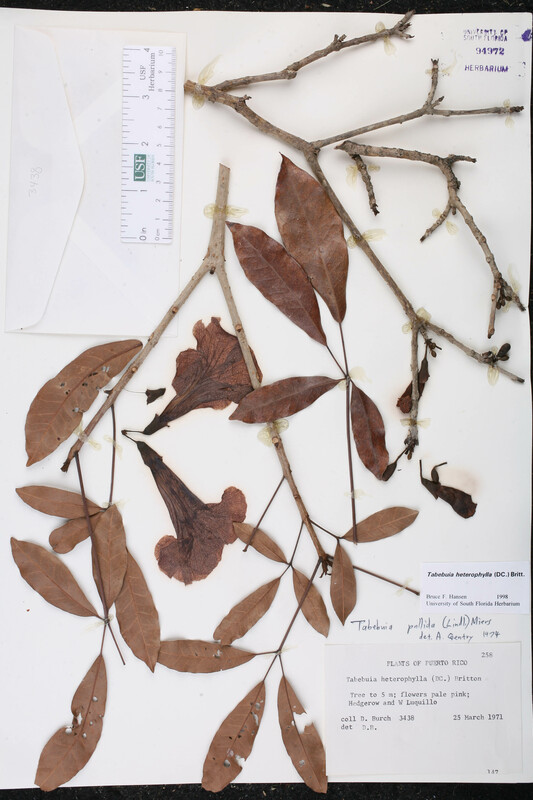 BASIONYM: Tabebuia pentaphylla Hemsley 1882; Bignonia pentaphylla Linnaeus 1763, nom. illegit. ; Bignonia leucoxylon Linnaeus 1753. 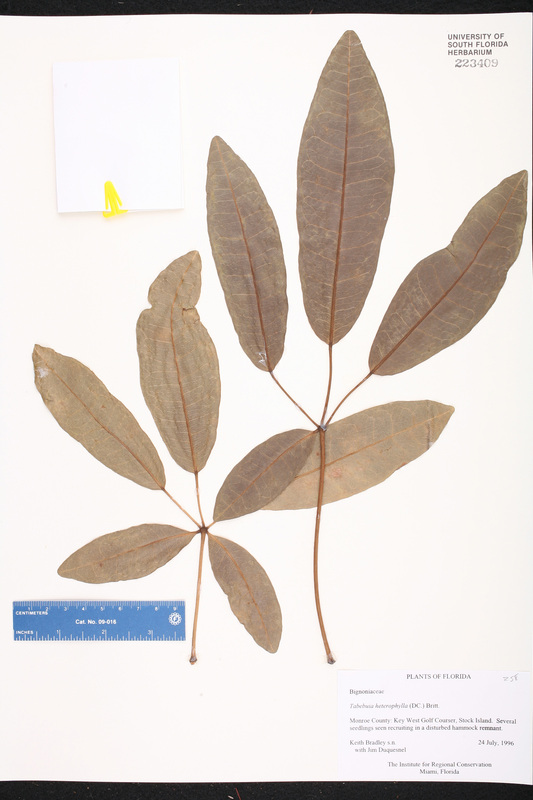 Tabebuia pentaphylla Tabebuia pentaphylla Hemsley, Biol. Centr.-Amer., Bot. 2; 495. 1882. 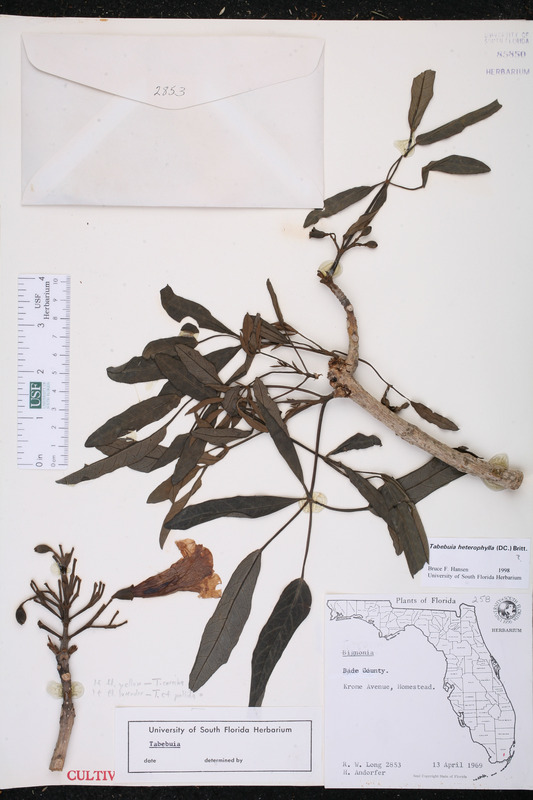 BASIONYM: Bignonia pentaphylla Linnaeus 1763, nom. illegit. ; Bignonia leucoxylon Linnaeus 1753. Tecoma pentaphylla Tecoma pentaphylla de Candolle, Prodr. 9: 217. 1845, nom. illegit. 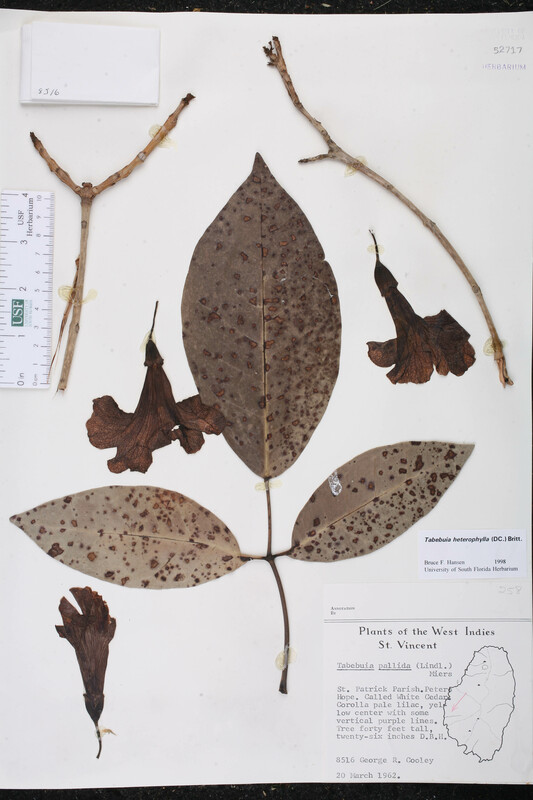 BASIONYM: Bignonia pentaphylla Linnaeus 1763, nom. illegit. ; Bignonia leucoxylon Linnaeus 1753. Bignonia leucoxylon Bignonia leucoxylon Linnaeus, Sp. Pl., ed. 2. 870. 1763, non Linnaeus 1753. 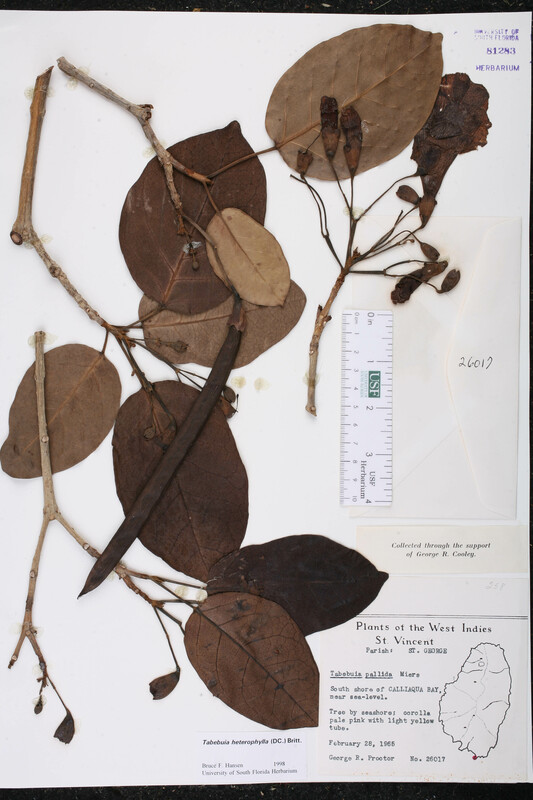 TYPE: BARBADOS: Without data (lectotype: Plekenet, Phytographia t. 200(4). 1692). Lectotypified by A. H. Gentry, Fl. Neotrop. 25(2): 193. 1992. Leucoxylon acuminatum Leucoxylon acuminatum Rafinesque, Sylva Tellur. 78. 1838. BASIONYM: Bignonia leucoxylon Linnaeus 1763, non Linnaeus 1753. Tabebuia arenicola Tabebuia arenicola Britton, Bull. Torrey Bot. Club 42: 375. 1915. TYPE: CUBA: Oriente: Guantanamo Bay, 17-30 Mar 1909, Britton 2142 (holotype: NY). Tabebuia beyeri Tabebuia beyeri Urban & Ekman, Repert. Spec. Nov. Regni Veg. 22: 84. 1925. 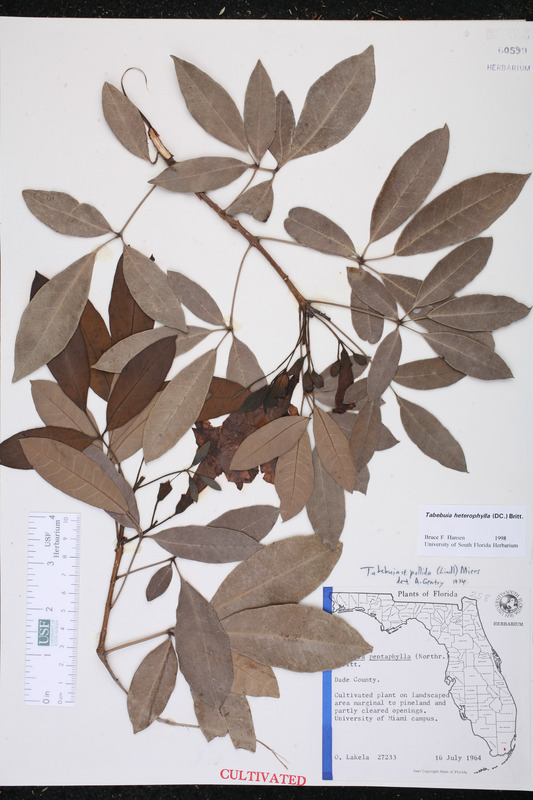 TYPE: CUBA: Matanzas: Ceiba Mocha, 29 Feb 1924, Ekman 18579 (lectotype: NY; isolectotypes: HAL, S). 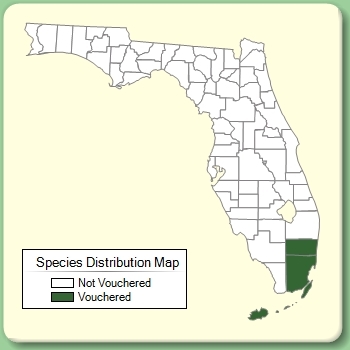 Lectotypified by A. H. Gentry, Fl. Neotrop. 25(2): 193. 1992. Tabebuia brigandina Tabebuia brigandina Urban & Ekman, Ark. Bot. 22A(10): 68. 1929. 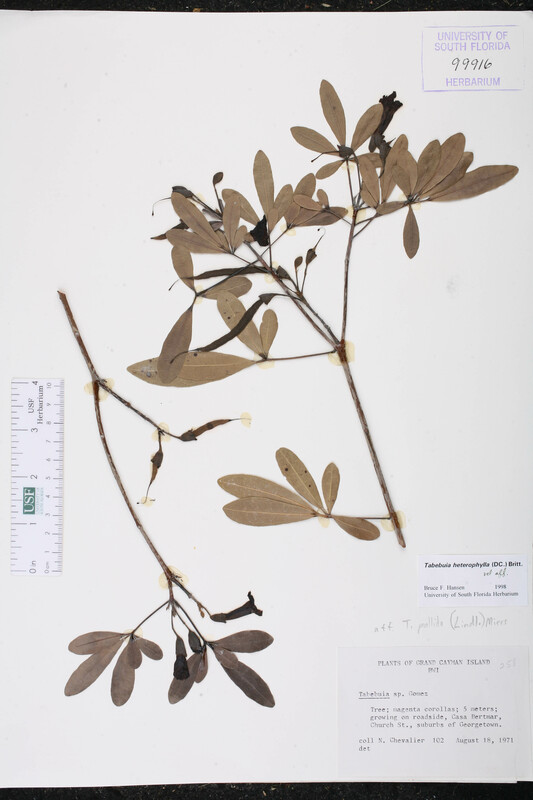 TYPE: HAITI: Morne Brigand, s.d., Ekman H2643 (holotype: S). 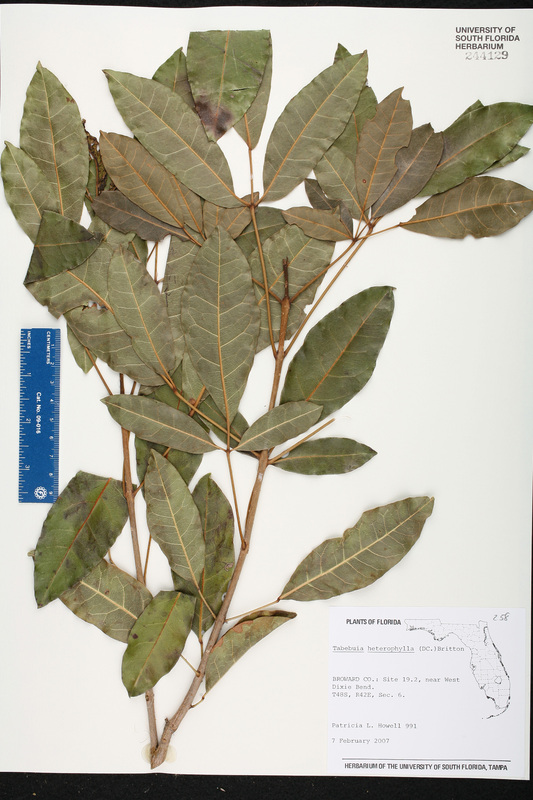 Tabebuia camaguayensis Tabebuia camaguayensis Britton & P. Wilson, Mem. Torrey Bot. Club 16: 107. 1920. TYPE: CUBA: Camaguey: Near Camaguey, 20 Apr 1912, Britton et al. 13110 (holotype: NY; isotype: NY). Tabebuia capotei Tabebuia capotei Borhidi, Acta Bot. Acad. Sci. Hung. 26: 19. 1980. TYPE: CUBA: Pinar del Rio: Peninsula Guanahacabibes, Oct 1977, Borhidi & Capote s.n. (holotype: HAL; isotype: BP). Tabebuia curtissii Tabebuia curtissii Britton, Bull. Torrey Bot. Club 42: 375. 1915. TYPE: CUBA: Isle of Pines: Nueva Gerona, May 1904, Curtiss s.n. (holotype: NY). Tabebuia dictyophylla Tabebuia dictyophylla Urban, Repert. Spec. Nov. Regni Veg. 22: 85. 1925. 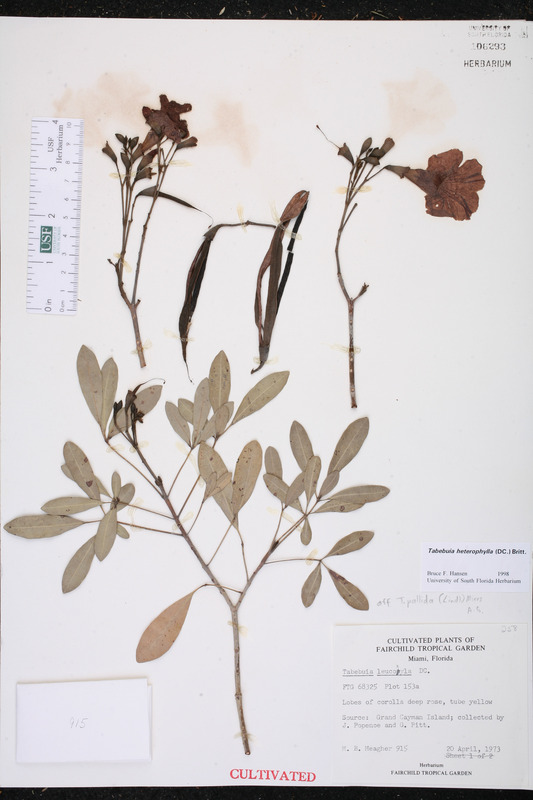 TYPE: CUBA: Matanzas: Pan de Matanzas, 30 May 1923, Ekman 18458 (lectotype: S; isolectotype: NY fragm). Lectotypified by A. H. Gentry, Fl. Neotrop. 25(2): 193. 1992. Tabebuia geronensis Tabebuia geronensis Britton, Bull. Torrey Bot. Club 42: 375. 1915. TYPE: CUBA: Isle of Pines: Nueva Gerona, May 1904, Curtiss s.n. (holotype: NY). Tabebuia leptopoda Tabebuia leptopoda Urban, Repert. Spec. Nov. Regni Veg. 18: 121. 1922. 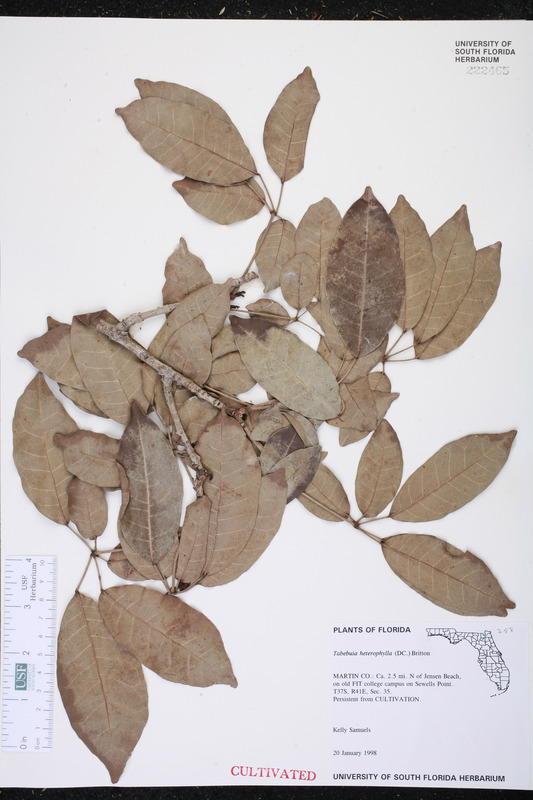 TYPE: CUBA: Pinar del Rio: Pinar del Cajalbana, s.d., Ekman 10461 (lectotype: S; isotype: NY fragm). Lectotypified by A. H. Gentry, Fl. Neotrop. 25(2): 193. 1992. Tabebuia lindahlii Tabebuia lindahlii Urban, Ark. Bot. 25A(5): 95. 1927. TYPE: HAITI: Tortue Island, s.d., Ekman H4261 (lectotype: S; isolectotype: S). Lectotypified by A. H. Gentry, Fl. Neotrop. 25(2): 193. 1992. Tabebuia lucida Tabebuia lucida Britton, Ann. Missouri Bot. Gard. 2: 48. 1915. TYPE: PUERTO RICO: Mona Island, Sardinera, 20-26 Feb 1914, Britton et al. 1686 (holotype: NY). 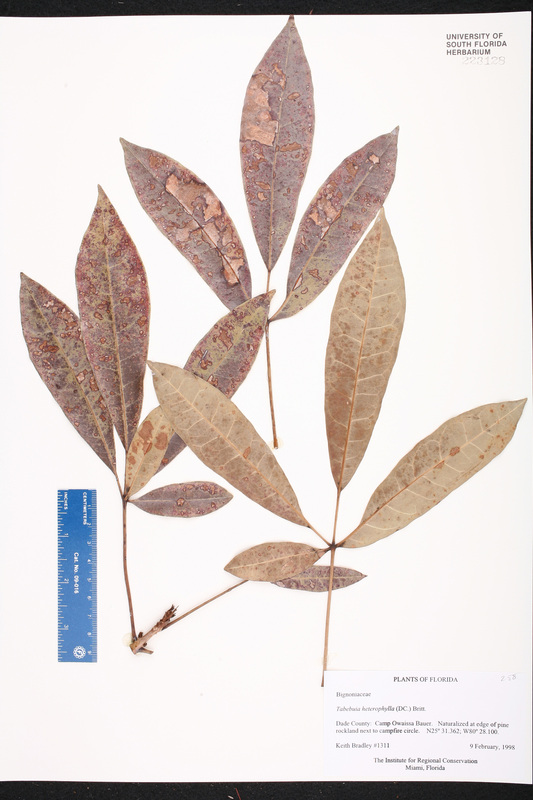 Tabebuia riparia Tabebuia riparia (Rafinesque) Sandwith, Taxon 4: 44. 1955. BASIONYM: Leucoxylon riparium Rafinesque 1838. Tecoma eggersii Tecoma eggersii Kraenzlin, Repert. Spec. Nov. Regni Veg. 17: 219. 1921. TYPE: PUERTO RICO: Banadero, Sierra de Luquillo, s.d., Eggers 984 (holotype: B(destroyed); isotypes: BR, HBG, M). USA Florida Monroe Co. 24 July 1996 K. A. Bradley s.n. USA Florida Martin Co. 20 Jan 1998 K. Samuels s.n. CULTIVATED. USA Florida Collier Co. 22 May 1963 O. K. Lakela 29821 CULTIVATED. USA Florida Miami-Dade Co. 16 Jul 1964 O. K. Lakela 27233 CULTIVATED. USA Florida Miami-Dade Co. 20 Apr 1973 M. B. Meagher 915 CULTIVATED. FTG 68325, Plot 153a; Source: Grand Cayman Island; collected by J. Popenoe and G. Pitt. USA Florida Miami-Dade Co. 13 Apr 1969 R. W. Long 2853 CULTIVATED. St. Vincent & the Grenadines St. Vincent St. Patrick Par. 20 Mar 1962 G. R. Cooley 8516 Called White Cedar.